At the University of Iowa, we are committed to providing student-athletes with tools for success in the classroom, but we also are dedicated to preparing them for their paths in life. One way to help our student-athletes develop and grow, personally and professionally, is through the Hawkeye Life Program. We need support from individuals like you to continue to provide robust experiences for our student-athletes. With your guidance and vision, Iowa's student-athletes will find success in competition, in the classroom, and in their future careers. According to the most recent NCAA annual report on academic success, Iowa's student-athletes are graduating at an all-time high of 90 percent, which is fourth-highest in the Big Ten Conference and is highest among Iowa's four Division I institutions. Iowa's student-athletes also boast higher graduation rates than those who are not student-athletes, yet we know that our student-athletes must be better prepared for life after college. To help our student-athletes receive a world-class experience, we need additional support. Your philanthropy will help us continue to provide the level of support and service our Hawkeyes require. Below are some funding ideas for consideration. Many other additional funding opportunities are available within the Hawkeye Life program. Please contact Sloane Tyler, or one of our athletic development officers at 319-335-3305 for more information. According to the most recent NCAA annual report on academic success, Iowa’s student-athletes are graduating at an all-time high of 90 percent, which is fourth-highest in the Big Ten Conference and is highest among Iowa’s four Division I institutions. Iowa’s student-athletes also boast higher graduation rates than those who are not student-athletes, yet we know that our student-athletes must be better prepared for life after college. To help our student-athletes receive a world-class experience, we need additional support. Your philanthropic guidance will help us continue to provide the level of support and service our Hawkeyes require. A gift of $1 million will create a named, endowed fund in support of student-athlete academic success and will allow you to name the academic success pillar. Earnings will be used, at the discretion of the associate athletics director for academic services and the Henry B. and Patricia B. Tippie Director of Athletics Chair, to fund academic success initiatives. A gift of $200,000 will create a named, endowed fund to support our tutoring program. Your support will further one of the most important academic services offered to our student-athletes. Last year, 45 part-time tutors and five learning assistants held 900 tutoring sessions to assist student-athletes with classroom work, study skills, organization, and time management. A gift of $115,000 will support graduate assistant positions and the Gerdin Athletic Learning Center’s resource library, which includes written materials and software programs. This support will help student-athletes receive individualized academic support, as well as implement software programs that assist students with composing term papers via dictation and address the larger challenges of learning with a disability. A gift of $25,000 will fund the GradesFirst software program for one calendar year. GradesFirst helps academic advisors, administrators, and tutors at the Gerdin Athletic Learning Center engage and support all student-athletes, with some specific applications for at-risk student-athletes. A gift of $8,500 will allow the Gerdin Athletic Learning Center to purchase an additional 17 laptops to meet the needs of our student-athletes. Giving back to the local community is an important piece of the Iowa student-athlete experience. Our 24 intercollegiate sports teams take incredible pride in their efforts to make a difference outside of competition, and it’s something our student-athletes have been doing for more than 20 years. Through the MidAmerican Community Engagement Pillar, an endowed fund within the Hawkeye Life Program, our student-athletes have the opportunity to excel as active role models and community leaders. Whether it’s through the Iowa Student-Athlete Advisory Committee (ISACC) Day of Caring, United Way, University of Iowa Hospitals and Clinics, and more, Iowa’s 650 student-athletes contribute, on average, more than 10,000 hours annually to communities throughout the Iowa City/Cedar Rapids Corridor. The Hawkeye Life Program connects student-athletes with these worthwhile endeavors, and while these service projects greatly impact numerous organizations in local communities, they also help today’s Hawkeyes become tomorrow’s leaders. A gift of $250,000 will create an endowed fund to support the ISAAC Day of Caring. In collaboration with United Way, all of Iowa’s 24 intercollegiate sports teams take part in the ISAAC Day of Caring, where student-athletes help various community organizations with their most pressing needs. A gift of $125,000 will create an endowed fund for the Hawk Cop Program. In collaboration with the Iowa City Police and UI Police Department, UI student-athletes meet once a month to discover more about careers in law enforcement. A gift of $20,000 will support the Coach for College civic engagement program, which helps student-athletes travel to Vietnam to teach school aged children various academic subjects, life skills, and sports. A gift of $10,000 will support child life tailgates at UI Stead Family Children’s Hospital. In collaboration with Iowa’s only children’s hospital, Hawkeye student-athletes visit with patients, provide them with small gifts, and work with them on craft projects. At the UI, we believe diversity and inclusion improve the campus experience for all student-athletes. Thanks to the Hawkeye Life Program, Iowa’s 650 student-athletes are connected by a common goal of promoting social justice and creating an inclusive environment through the power of sport. We offer programming and support to underrepresented student-athletes and educational opportunities for all student-athletes about the value and importance of inclusion. A gift of $1 million will create a named, endowed fund in support of diversity and inclusion and will allow you to name the diversity and inclusion pillar. Earnings will be used, at the discretion of the associate athletics director for academic services and the Henry B. and Patricia B. Tippie Director of Athletics Chair, to fund diversity and inclusion initiatives. A gift of $250,000 will provide an endowment fund for the Multicultural Focus Group, a group that offers minority student-athletes a safe and welcoming place to discuss issues and promote a sense of unity within Hawkeye athletics. Your support will fund programming, which includes speaker fees, transportation for off-site programming, food, and mentoring opportunities. A gift of $60,000 will fund a part-time diversity and inclusion coordinator to lead programming and strategy for a two-year term. A gift of $50,000 will provide support for the Personalized Academic Support System, which provides assistance to student-athletes who are on academic probation or are underprepared for college. Your support will help teach organizational and problem-solving skills, as well as support efforts to map out weekly plans for academic success. With long days of competitions and practices, film sessions, travel, strength training, and more—while managing a rigorous academic workload—UI student-athletes lead extremely busy lives. They also face unique challenges and stressors that impact their academic and athletic success, as well as their overall well-being. The UI Department of Intercollegiate Athletics aims to keep Hawkeye student-athletes healthy and safe. 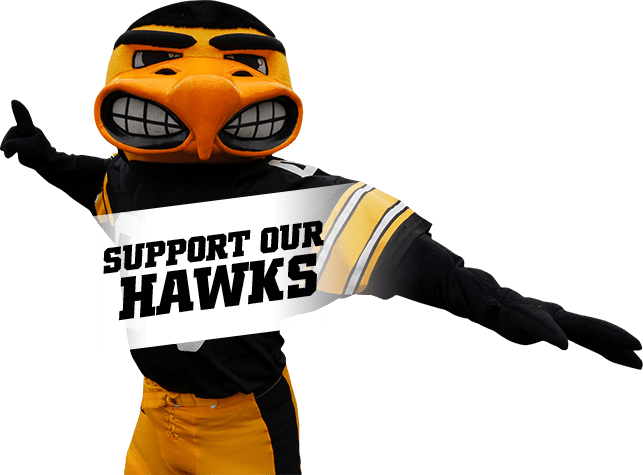 Through alcohol and drug education, healthy eating and body image counseling, injury recovery counseling, and more, the Hawkeye Life Program provides vital resources to help student-athletes manage stress and maintain health and wellness. A gift of $1 million will create a named, endowed fund in support of student-athlete health and well-being and will allow you to name this pillar. Earnings will be used, at the discretion of the associate athletics director for academic services and the Henry B. and Patricia B. Tippie Director of Athletics Chair, to fund health and well-being initiatives. A gift of $500,000 will subsidize the director of sports nutrition position. Making smart dietary choices can be challenging for any of us, but student-athletes face a particularly unique set of challenges. With a permanent endowed position, we can help student-athletes manage their diet within the demands of their daily schedules while maximizing their energy, performance, and recovery. A gift of $50,000 to $100,000 will fund one of our four refueling stations for one year. A gift of $20,000 will fund a guest lecture series for sports psychological services. It will also support year-round access to personal counseling, performance psychology services, and psychological rehabilitation after an injury. A gift of $10,000 will provide one year of licensing fees for nutrition education and counseling software, as well as provide access to educational applications. Employers, now more than ever, want to hire leaders. Hawkeye student-athletes have every opportunity to become leaders among their teammates and peers. Through the Hawkeye Life Program, Iowa’s student-athletes receive formal training and preparation to meet today’s workplace and community leadership needs. A gift of $1 million will create a named, endowed fund in support of student-athlete leadership initiatives and will allow you to name the leadership pillar. Earnings will be used, at the discretion of the associate athletics director for academic services and the Henry B. and Patricia B. Tippie Director of Athletics Chair, to fund leadership programming. A gift of $200,000 will endow the Athletic Transition Seminar and the Hawkeye Life Experience, a two-course program that enhances our academic endeavors within the Gerdin Athletic Learning Center. With the help of such courses, all Hawkeye student-athletes will have applicable tools to be leaders in their careers and their lives. A gift of $60,000 will create an endowment to fund the Hawkeye Connections Program, which allows our student-athletes to meet with successful members of the community and build connections with mentors. A gift of $50,000 will fund enhanced internship opportunities for student-athletes, including hiring a part-time coordinator focused on finding world-class internships for our student-athletes. A gift of $10,000 will fund a speaker, focused on women’s leadership, to come to campus each year. Going pro is a dream many student-athletes aspire to achieve, but in reality, fewer than two percent of collegiate student-athletes play professionally, according to the National Collegiate Athletic Association. That’s why the UI places a high importance on graduation rates and providing student-athletes with numerous professional development opportunities. The Hawkeye Life Program provides student-athletes with paths to employment through nontraditional channels. While we continue to put a focus on purposeful career planning, mock interviews, and personality assessments, professional development also means providing student-athletes with opportunities to practice real-world skills in controlled situations, gain insights regarding employment trends, interact extensively with professional mentors, and navigate in a professional environment. A gift of $1 million will create a named, endowed fund in support of student-athlete professional development and will allow you to name the career development pillar. Earnings will be used, at the discretion of the associate athletics director for academic services and the Henry B. and Patricia B. Tippie Director of Athletics Chair, to fund programming for professional development. A gift of $500,000 will create an endowment in support of the Hawkeye Professional and Career Exposure (P.A.C.E.) Program and the Hawkeye HealthCARE Program. Your support will allow student-athletes to take part in an eight-week structured internship and job-shadowing program during the summer. A gift of $75,000 will endow a fund to allow for two guest speakers, focused on financial management, to speak on campus each year. A gift of $50,000 will provide career development resources and tools for student-athletes.